THE FIRST EVER 100% VEGAN, SULFATE-FREE SHAMPOO THAT TRULY PREVENTS "SWIMMERS HAIR"! PRESERVES THE HEALTH AND VIBRANCY OF HAIR EXPOSED TO POOL, SPA OR OCEAN WATER. PREVENTS "SWIMMERS GREEN HAIR." COMBATS GUMMY, CRUNCHY, CLUMPY, DRY, TANGLED HAIR. INFUSES VITAL MOISTURE FOR NATURAL HYDRATION AND RADIANT SHINE! 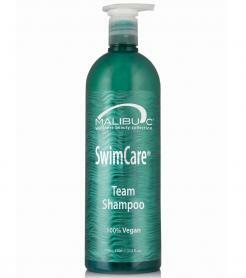 Gentle, daily shampoo formulated with antioxidant vitamins and botanicals specifically for swimmers of all ages. Remember to purchase your pump for easy dispensing! Helps prevent build-up of pool and spa chemicals (chlorine, bromine) and hard water minerals (copper, calcium, and magnesium) while gently cleansing hair and scalp. Helps prevent green hair caused by copper. Leaves hair soft, manageable, and full of shine. Completely SAFE for all hair types and for processed hair – both color and perms! Swimmers of all ages exposing their hair to chlorine, bromine and minerals from a pool or spa that can attach on to the hair and scalp and cause dryness, damage, discoloration, hair loss, flaky, itchy scalp, and the inability for chemical services to properly process. Massage Swimmers’ Action Shampoo into wet hair and scalp to create a rich, foamy lather. Rinse. Follow with Swimmers Wellness Conditioner. Ascorbic Acid (Vitamin C) helps protect hair against free radical damage caused by exposure to the sun and air. EDTA is a chelating agent that helps lift minerals. Vitamin E Acetate helps protect hair against free radical damage, moisturizes hair and scalp tissue. Panthenol penetrates the hair shaft to protect hair's strength and moisture.